Leighton Contractors chose a range of mobile cranes and loading platforms from Preston Group for use at the new QUT Science and Engineering Centre project. The $230 million dollar project, which is due for completion in 2012, required a range of mobile cranes, steel props and loading platforms to complete the construction of a 50m below ground level swimming pool and the new P and Y Blocks of the building. Preston’s range of Superminicrawler mobile cranes including the Maeda LC-383, which installed form work and shutters as well as performed general lifts were put to use for the swimming pool work. 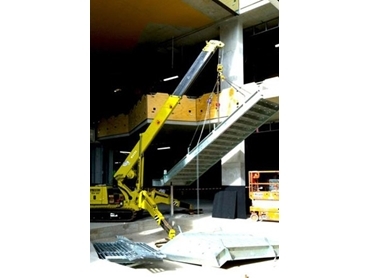 Various mobile cranes including the Maeda MC-285, MC-305, MC-405 and LC-785 models assisted in the construction of narrow access areas such as stairwells in the new P and Y Blocks of the building. Preston’s patented Superdeck range, which utilises a retractable loading platform system to allow for the vertical stacking of units, was used for the exterior construction. The Superdeck helps increase the efficiency of materials handling and crane productivity by providing cranes with uninhibited access to the platforms from above to minimise any hindrance to their ropes and loads. The construction of the swimming pool as well as the P and Y blocks at QUT was expedited with the use of Preston’s retractable loading platform system and Superminicrawler mobile cranes.